1 day: Arrival in Singapore. Accomodation in a hotel 4 or 5 stars (usually Peninsula Excelsior). Free time. 2 day: Breakfast. Tour of Singapore: Sea side, "Small India", China town, administrative buildings, Shri Mariaman temple, the botanic gardens. Flight to Jogyakarta. Accomodation in hotel 4 or 5 stars (usually Melia Purosani). 3 day: Breakfast. Tour of Jogyakarta: The temples "Borobudur", "Pavon", "Mendut". 4 day: Breakfast. Tour of Jogyakarta: The hinduist temple "Prambanan". 5 day: Breakfast. Flight to Bali. Accomodation in a hotel 4 or 5 stars (usually Grand Mirage). Religious fests and ceremonies. 6 day: Breakfast. Tour of Bali: traditional dances and arts. 7 day: Breakfast. 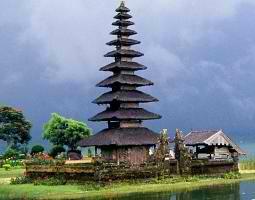 Tour of Bali: the temples "Uluna Danu", "Tana Lot", "Menui Taman Ayun"
8 day: Breakfast. Flight Bali-Singapore and back.